At the stroke of midnight on July 1, 2017, the government launched what is billed as the “biggest tax reform” since India’s Independence. The Goods and Services Tax (GST) is designed to bring the country into a common single market. It sets tax slabs for different commodities, and while there may be disagreements on how big a reform this will turn out to be, it is clear that it provides an important signal on policy directions. For public health, a big bang impact of GST is the tax on “sugar-sweetened aerated and flavoured water” which is now pegged at 40 per cent. These beverages, which include all the colas and such junk drinks, with high sugar and hardly any nutrients, will have an additional 12 per cent cess over the luxury tax slab of 28 per cent. This cess is reserved for what is called the “sin” category of goods. 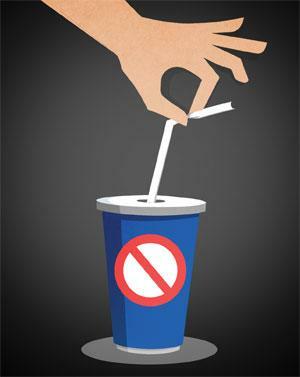 In 2014, Mexico became the first country to impose a tax on sugary drinks. A recent joint study by US and Mexican health academics found that this relatively small tax had decreased consumption by some 10 per cent by the end of the second year, most importantly, in the poorer sections of its society. This is when the tax is small—just one peso per litre of the drink (roughly Rs 3.5 per litre). A bigger impact has been noted in California, where the tax is US $0.33 cents ( Rs 21 per litre). This tax, finds a recent report from Euromonitor International, reduced cola consumption by 21 per cent and increased water consumption by 63 per cent. In contrast, there was an increase in cola consumption in the rest of the US. So, taxation counts. Now many other countries are looking at imposing “sin” tax on all varieties of junk food. For us this move to tax bad food is critical. In June 2017, British medical journal The Lancet published a review of the prevalence of diabetes in 15 states of India. This study by a group of medical practitioners, funded by the Indian Council of Medical Research, has worrying numbers. It finds that while some 7 per cent people in India (based on 15 states’ data) had diabetes, the prevalence of pre-diabetes (early signs, particularly elevated blood sugar levels) was a staggering 10-15 per cent, depending on the criterion used. This is no small health burden on a poor country. Their conclusion is we are undergoing an epidemiological transition. States with higher GDP—Gujarat, Maharashtra, Tamil Nadu and Chandigarh—have higher prevalence of this disease as compared to Bihar or Jharkhand. Delhi and Goa, with high income levels, are still awaiting sampling. Rural areas have lower diabetes rates than urban. But most worryingly, the study finds that the poor in urban well-off states have higher incidence of diabetes than the rich in the same cities. In other words, the rich in rich cities have started to learn good food habits. But the poor are now falling into the trap of bad food. The study also found that conversely, in rural areas it was the more socio- economically advanced that were falling prey to diabetes. “It is an epidemic that is in a state of transition,” it noted. With such large numbers of poor in urban areas and such large numbers of the getting-rich in rural areas, this can easily get out of hand. We are going from lack of food or malnutrition to over-nutrition because of bad food. This is a transition that can be avoided. That’s why this move under GST is important. The 40 per cent “sin” tax in India would add Rs 15.60 on one litre of colas. This is much higher than the tax in Mexico and hence will hopefully count. GST also puts other high sugar foods, including chocolates, in the “luxury” category. The move to disincentivise junk food now needs to be supported with regulations on labelling that let us know how much added sugar, salt and fat we are eating. The Food Safety and Standards Authority of India (FSSAI) is dragging its feet on this. It must not take its cue from the Donald Trump administration, which has succumbed to pressure from the big food companies. This month, the US Food and Drug Administration said it would delay the implementation of the planned food-labelling requirements devised to inform the consumers of this ever-fattening country. That’s not all. GST also incentivises food that is not branded, packaged and processed. Today, our food safety system willy-nilly pushes us to believe that only when the food is branded or processed can it be safe. Across the world this understanding of food safety has edged out small producers, who can’t compete with high quality and enforcement standards. Today FSSAI’s rule on food establishments does not allow for the use of unbranded food. It is unsafe, according to them. The mandarins of the finance ministry have understood that safety is about promoting food that is nutritious and connects with livelihoods. Let’s hope the message hits home.